Rich and I reviewed the Plantronics SupraPlus HW251N-USB Wideband headset, featuring wideband codec support for use in VoIP applications such as Skype and Microsoft Office Communicator. Rich actually got two pre-production models and was kind enough to give me one of the SupraPlus headsets. Actually, he wanted me to be his guinea pig to test the audio quality since I get to hear and review quite a few VoIP products. We tested the monaural style Plantronics SupraPlus HW251N-USB using both Skype and Microsoft Office Communicator. The audio quality was quite good. I believe the microphone captures a wider range of frequencies to enable the wideband support. The noise-canceling microphone filters out excessive background sound. The Plantronics SupraPlus HW251N-USB features inline button controls. 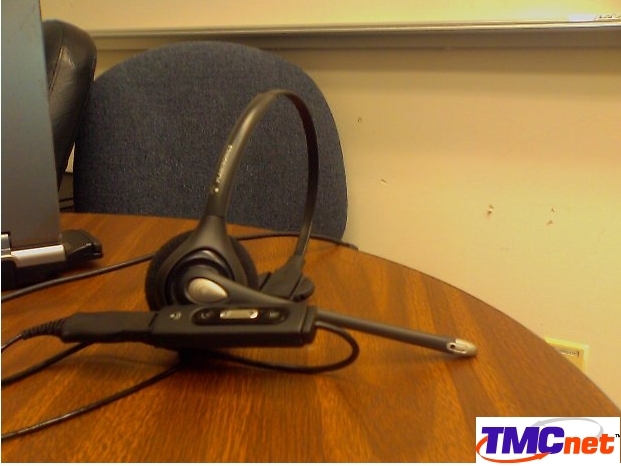 The headset itself features volume up/down buttons, mute, and even a disconnect/end call button that works with Microsoft Office Communicator. Interestingly, if Skype is running and if you press this disconnect/end call button you get simulated dial-tone. Not sure what that was about. I noticed one end of the headset actually uses a RJ45 clip to connect into what I believe is the DSP processor. I've never seen Plantronics use a RJ45 clip for their headsets, but in theory they must be making some of their components more modular for interchanging various headset components. Or at least, one can hope. Nothing worse than having an incompatible base unit to a headset. The headset is wired (to your USB port) and I'm much more a fan of wireless headsets even for desktop PCs. The Plantronics Voyager 510-USB Bluetooth headset is one of my favorites (see my review) and it works with your mobile phone and your desktop PC with the Bluetooth USB dongle. Of course, the 510-USB isn't a wideband codec headset, so if superior voice quality is your gig, then the SupraPlus HW251N-USB might be a better choice. Certainly organizations using wideband VoIP applications that have call center agents that don't roam around while on phone calls will find the SupraPlus HW251N-USB a good choice. Lastly, go check out Rich's in-depth review here for his thoughts on this headset.